Jana Andolan Party today started its campaign eyeing the upcoming municipality elections. 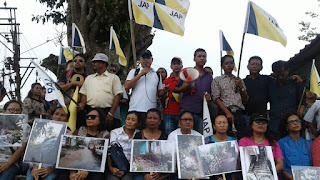 JAP which was formed during early this year contested the Kalimpong Assembly constituency vote which is lost by margin of more than 11 thousand vote but the party got boosted when they lead in 17 wards out of 23 under Kalimpong Municipality. From then onward JAP have focused its attention in all wards. A 6 days ward campaign of JAP started today from Girls High School. A massive amount of JAP town committee members with large pix of the present municipality lack of development works, overflowing of rain water, block drain and culvert in their hand. The members went to Tirpai , CST ,11 Mile and ended at 10 th Mile fatak covering ward 2-7 today. Pradeep Chhetri town committee coordinator of JAP talking to reporters told that the present municipality has failed in all sphere. Instead of development work did not focus in primary problem of town and adjoining people. He said we have Filed an RTI during assembly election asking what and where was the development work done by Kalimpong Municipality and what was the amount used but we have not got an answer . He said every ward has its own problem. We got to know about the problem during assembly election campaign. He urged the ward people to give upcoming 5 years to JAP after which we will make New Kalimpong,New Darjeeling , New Kurseong and New Mirik. He informed the campaign will end on 3rd September . 0 Respones to "JAP begins civic poll campaign"